Dining tables and chairs are no longer just one height. You have the option to choose between standard, counter, or bar height from many different collections in a variety of styles. This allows you to create a dining space that will show off your personality and meet your entertaining needs. Small dining spaces can still look stylish with the use of round or square bar and counter height tables and coordinating chairs. Completely redesign your dining room with a traditional feel for family meals or use a taller table to set up a casual gathering space for friends. What is standard height dining? Standard height dining tables, sometimes called regular height dining tables, sit between 28 and 30 inches and should be used with 18 to 23 inch chairs, stools or benches. Why should I choose standard height dining? This traditional option is the most common and gives you the widest selection. You can mix and match chairs, stools and benches from a vast array of collections, styles, and finishes. Many people find standard height dining to be comfortable because their feet are able to rest naturally on the floor regardless of their height. Standard height dining is also very inclusive as it's the perfect height for those in a wheelchair and is also more kid-friendly, as taller tables and chairs may require you to lift your child into their seat. 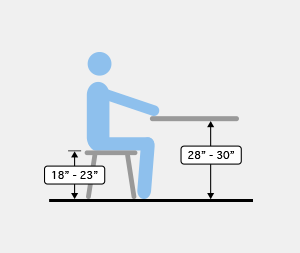 What is counter height dining? Counter height tables sit at around 34 to 36 inches and should be used with stools or chairs that sit around 24 to 26 inches. 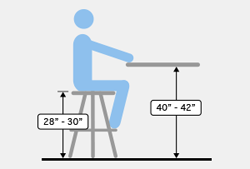 Why should I choose counter height dining? A step above regular height, counter height tables and chairs gives you a unique look in your dining space or eat-in kitchen. Counter height tables are great for food prep as the height, as its name implies, sits near or at the same height as your counters. Counter height dining is also great for small or cramped spaces as the raised height creates a more open and less traditional look than standard height dining. 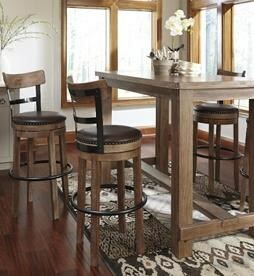 Thanks to this less formal and traditional look, counter height dining is great for entertaining guests. The environment they create tends to be more casual and the table sits at the perfect height for your company to rest their drink regardless of if they’re sitting or standing. 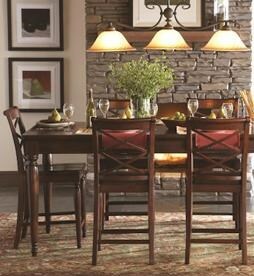 Revamp your dining room to match your style with contemporary or casual pieces of your choice. 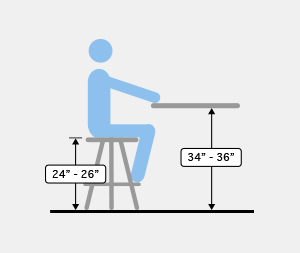 What is bar height dining? Bar height tables sit at 40 to 42 inches and should be used with stools or chairs that sit around 28 to 30 inches. Why should I choose bar height dining? Bar height dining takes the entertaining features of counter height dining and raises them even higher. The extra height makes them even further removed from the traditions associated with standard height dining, and this is reflected in the environment they create. Rooms that utilize bar height dining are optimal for entertaining and can easily, and comfortably, be converted into a standing space. Adjustable Height Seating: Customize the seating experience with an adjustable height stool. People of different heights can still sit comfortably with adjustable height seating and you can change up your table without having to redo the entire room thanks to the adjustable seating. Arms or Armless: Chairs with arms add comfort, style and support while armless options can give you a more modern and clean look. Back or Backless: Tall backs, low backs or backless can give your room a certain look. Decide based on style as well as comfort. Swivel Seat: Rotating side to side is a great feature. It allows you to sit comfortably, leave your seat with ease, and always have the best view. Outdoor: Bar and counter height aren’t just for your indoor dining room. Create a stylish and fun entertaining space outside with taller outdoor furniture. Your patio can be a casual and welcoming space for entertaining with the use of counter or bar height pieces.